Hah - is this bright or is this bright? I used various fabrics already in my stash, but purchased the white with stars and the border black with dots. Note - there is NO BLENDING OF VALUES IN THIS EXAMPLE. I used 6-7 strips in each set, making the first and last strips wider -- 2 1/2 inches. This gives you some leeway in how you place your ruler. The strip in the middle of your strip set frequently appears circular and stands out. And I DO have enough wedges left over (you get 9 wedges from each WOF strip set) to actually make another row, including the unloved too-pink block. However, this is for a little guy and he doesn't need it larger. Size is approx. 62" x 62". You're right. The pink doesn't look bad at all but you're also right - not appropriate for a boy. But gosh how neat. And Elaine, I really love the turquoise & lime green in the corner border area. Smashing dahling, simply smashing. Pink is just a color, just like blue is just a color! Go ahead and put the pink one in for a boy, its only one stripe (call it light red if you have to!). 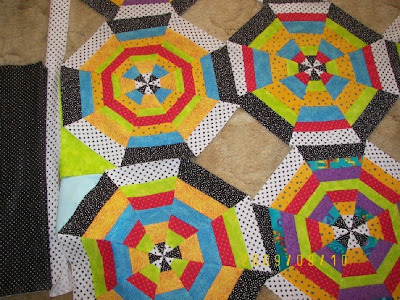 This quilt design is fun, fun, fun and energetic. I would love to take your class @ guild next weekend but I'm a bridesmaid to my sister in Tacoma, so will miss it. Love your Kaleidoscope creations! sharon a.
Wow! 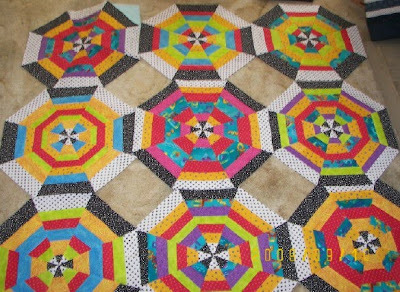 This is a bright, happy quilt! I LOVE it! (Even the pink-ish block looks good. I agree with AnnieO - leave it in.) Your corner color choices are great, as are your border choices. 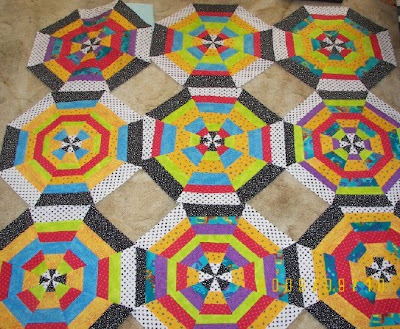 I've been thinking of hexagon quilt too lately... too scared to take the plunge. That's my kind of quilt - lots of color and no blending. I love it! This one is great. I wouldn't take the pink block out. It's a great zinger in with all the bright and cheery colors. Boy or girl doesn't really matter. It's certainly not feminine looking! I like that lime green option a lot. This is a fun fun quilt! Will serve any child very well. That lime green looks great with the black and white borders. I think I need to take "bright" lessons from you. I just can't jump off the cliff and do anything really bright.